Sorry for MIA for a that long time. I'm too lazy to manage my blog. and provided that there's no visitor. Best part is my form 6 life. Main reason for this is because of them. thanks Seok Heng, Aster, Mavis and others for all the fun after school dismiss. This definitely hold me back from transferring. Next would be my "motivations". haha. it's really fun to go school since then. Of course, I had a lot of funs with my new classmate. Although I'm always alone before this but thanks to them, I've been labelled as one of the "kiasu" by the another kiasu(he-knows-who-he-is!:)). Went to Bangkok for the 2nd time after that. This time with my sister,cousin and my dad sides grandma. Unfortunately after the holiday i bang-ed my car. 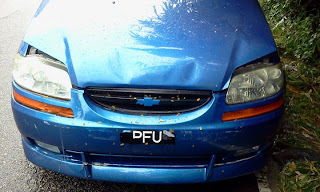 this time my car knocked into Seok Heng's. Quite serious accident that was. But gladly everything solved. 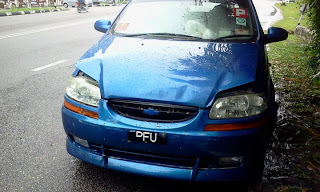 Photos below were my car's condition after that day's chaotic situation. That was quite a fun experience. We were actually excited after all that. can even laugh out and joke around after that. only thing was the phobia after this. will really freak out when the car gets near to the car in front. in this period of time, everything changed. I joined Botw. (Boards of Traffic Warden) I admit what I want at first is just extra marks. But after long time staying there, playing around with other wardens, I actually enjoy duty more than everyone else. btw, BOD Oc is awesome.! "oh-sum camp" we call it. camps all around these month. last week was BOD Oc, and tomorrow is for Vad Oc. Will update more when i remember. btw i'm in dilemma whether to cut my hair short again. feel like keep it but i don't like to tie it up, don't like the feeling of my face being exposed. but my popularity did boost up a lot after i cut my hair short.Advice anyone ?